I first met Chef Marcus Jernmark in November 2005 at a culinary event hosted by then Consul General of Sweden in New York, Ambassador Kjell Anneling and his wife, Mrs. Birgit Anneling. Chef Marcus Jernmark was 23 years old at the time, and he and Chef David Johansson catered the culinary event promoting Swedish gastronomy. I was highly impressed with their culinary masterfulness and creativity, and wrote, they "are well on their way as rising stars in the culinary world." On October 4, 2012, I met Chef Marcus Jernmark again, this time at Restaurant Aquavit in New York, for Savor Skåne, a culinary event focusing on the culinary region of Skåne, Sweden hosted by Visit Sweden. 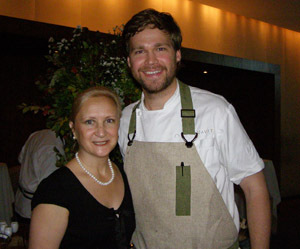 Chef Marcus Jernmark joined the Restaurant Aquavit team in 2009, and is the Executive Chef at the restaurant. True to my prediction in 2005 that he was a rising star, on October 3, 2012, Restaurant Aquavit earned their first Michelin star, high praise indeed in a city of great restaurants. Sitting down with Chef Marcus Jernmark, I inquired about who had influenced him in his career, to which he replied, "the industry, more than a specific chef." He honed his career first in his native Sweden working in restaurants and creating a concept catering show based in Gothenberg, Sweden to promote Nordic cuisine, working at the Swedish Consulate in New York, and now at Restaurant Aquavit. Hard work combined with resourcefulness and a natural talent, he has been able to parlay his passion and love for the industry into a successful career. As a chef, he often works 15-17 hour days, and when I asked him about what advice he would give to those considering a culinary career, he replied, you must be focused and determined, work at top tier restaurants if you can, and if needed, work two jobs at the start of your career to follow your dream. 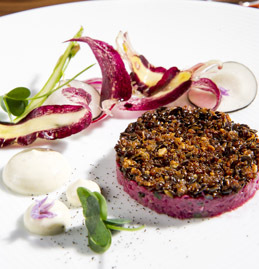 Every chef has a favorite culinary season, for Chef Marcus Jernmark, it is Autumn, rather on the late side in October and November when the root vegetables have been sitting in the ground for awhile and are at their best. His favorite ingredient is sunchokes, and he likes porcini mushrooms as well as they both have the deepest flavors you can obtain from food. When not working in the restaurant on Sunday, he likes to eat and drink, and go out for lunch and dinner to experience other restaurants. He loves New York and said that he is, "addicted to the City, which is the best food city in the world." 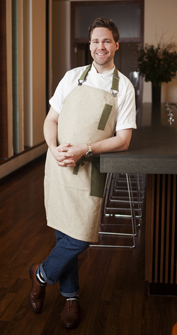 Although time does not often allow, Chef Marcus Jernmark also likes to play golf. Executive Chef Marcus Jernmark and Keri Levens, Beverage Director, graciously provide a delicious taste of Restaurant Aquavit and Scandinavia until you can dine at the restaurant. Method for the Pickling Liquid: Combine all ingredients and bring to a boil, stirring to dissolve sugar. Cool. Refrigerate overnight. Strain through fine-mesh sieve. Refrigerate. Method for the Glass-Blower Herring: Soak herring in water for two days in refrigerator, changing water after first day. Bring pickling liquid to simmer with remaining ingredients. Remove from heat and infuse overnight in refrigerator. Strain through fine-mesh sieve into container large enough to hold herring. Rinse herring thoroughly in cold water. Add to container with liquid. Refrigerate overnight. Method for the Västerbotten Cheese: In sauté pan, toast rosemary, bay leaves, peppercorns, caraway, allspice, and juniper until fragrant. Add aquavit. When aquavit completely evaporates, add oil. Heat to 212° F (100° C). Steep overnight. Strain into fine-mesh sieve into container with Västerbotten. Marinate overnight. Method for the Bleak Roe: Line fine-mesh sieve with coffee filter. Add roe. Drain roe by suspending sieve over bowl overnight in refrigerator. Method for the Pickled Pearl Onions: Pour pickling liquid over onions. Cover and refrigerate. Method for the rye Bread Chips: In airtight container, freeze bread. Heat oven to 300° F (149° C). Line sheet tray with silicone mat. Spread frozen bread on tray. Brush with butter. Season with salt and pepper. Cover with another silicone mat then sheet tray to weigh down. Bake until crisp, about 20 minutes. Let cool completely. Break into bite-sized pieces. Store in airtight container. Presentation: Trim sides of herring, including fins, and cut half-lengthwise. Trim each side into a perfectly rectangular portion, cutting away as little flesh as possible. Cut cheese into 1/3-inch cubes. Add a smear of sour cream on the plate. Garnish will dill, dill oil, blossoms, potatoes, olive oil, salt, and pepper. Method for the truffle mayonnaise: In a high-speed blender, blend mustard and egg white while slowly adding canola oil. Add miso, truffle and capers. Puree. Season with truffle oil, salt, and pepper. Blend in xanthan gum, refrigerate. Method for the tartar topping: Heat oil to 350° F (177° C). Fry seeds 90 seconds. Drain on paper towels. Season with salt and pepper. Let cool. Mix with breadcrumbs. Presentation: In stainless bowl over ice water bath, measure one-teaspoon mayonnaise. Add remaining ingredients. Mix. Season with salt, and pepper. Plate with a spoonful of mayonnaise. Garnish with seasonal vegetable, greens, and flowers. Method: Infuse the vodka with coriander for 11 days, covered. Add dill. Infuse three days. 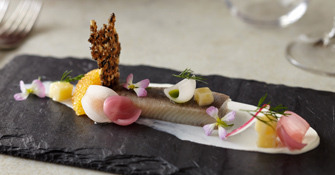 Read about Restaurant Aquavit in the Gastronomy section. © November 2012. Luxury Experience. www.LuxuryExperience.com. All rights reserved.